Norina Werner, a recent high school graduate from Germany, committed a year to living and serving Mwana Villages in Congo. With Nadia’s upcoming departure in April and her return to begin her college studies, we recently sat down with her to ask about her experience over the past year. How did you decide to spend a year in Pointe-Noire? I knew that I was incredibly fortunate to have been born in Europe…thousands of people don’t get the same chance that I had. I wanted to give of myself for others, especially children. What would you want others to know about Mwana? I have been so impressed by the work that everyone does at Mwana Home—everyone works with all their heart and gives what they can. For me, Mwana is truly an exceptional organization and is all based on people being generous and benevolent. It impresses me that no one is paid except the Congolese people working there—this is like no other organization who use money for their own personal gains. 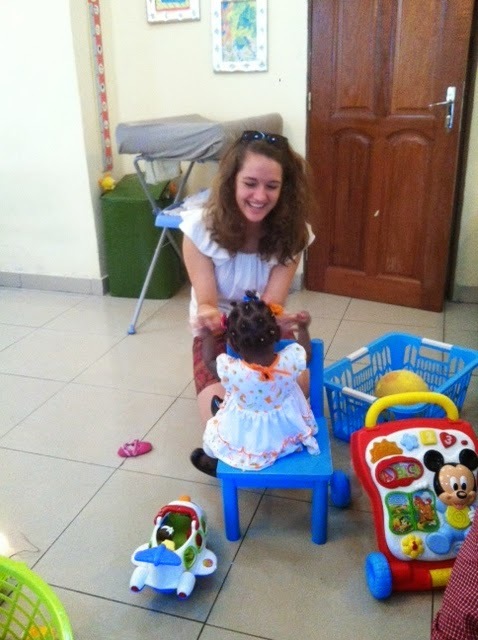 I am seeing more and more how the people with Mwana Home can truly change the lives of the babies who are there. The fear and insecurities in the eyes of the babies when they arrive disappears after time and in its place is joy and love. It’s truly indescribable. We are truly grateful for Norina’s selfless love, time, and gifts that have deeply impacted all of us here at Mwana. You will be deeply missed!